Dodd and Carole Shay founded Alaska Assistance Dogs (AAD) in 2001. After training dozens of service dogs for Alaskans and working with hundreds of kids and teens, it is time for retirement. The Board of Directors voted to reduce the mission to include “information, education and referrals.” The winding down of service dog training took place in 2014. Founder Carole Shay continues to work with therapeutic programs for children and teens, along with education and advocacy for service dog teams and education for businesses. Meanwhile, the younger generation of quality professional service dog trainers will continue in our place. See References for Dr. Bergin-trained AAD trainers. Generally when people hear the term “service dog” they often think of guide dogs for the blind or service dogs for individuals using a wheelchair. These were the first type of assistance dogs. There are many other types of dogs now to assist their owners: dogs for seizures, diabetes, autism, post-traumatic stress disorder and anxiety disorders, just to name a few. All service dogs perform tasks for their owners. The key requirement for a service dog is training for these tasks, and as important, the ability to go into public places and behave well in all situations. Public venue training is key to the Federal ADA law that allows a dog in public places, such as restaurants, stores and airplanes. Please note a dog that keeps you calm at home with a vest bought on-line, is far from a legal service dog under ADA law. Public accommodation = public training. Why Use Service Dogs for Psychological Needs? Dogs naturally read humans for mood, body chemistry and other physiological changes. Their willingness to bond with and serve their human makes for a perfect working team. With the aid of service dogs people are able to immediately feel their symptoms ease. Working with doctor or therapist, many people using service dogs can reduce their medications; some totally stop them. A service dog is not a cure for PTSD, but it allows an individual back into the community with comfort and support. One meaningful sentence is often repeated among service dog owners, “It gave me my life back.” Powerful. If AAD is not training any more, how can it help me? 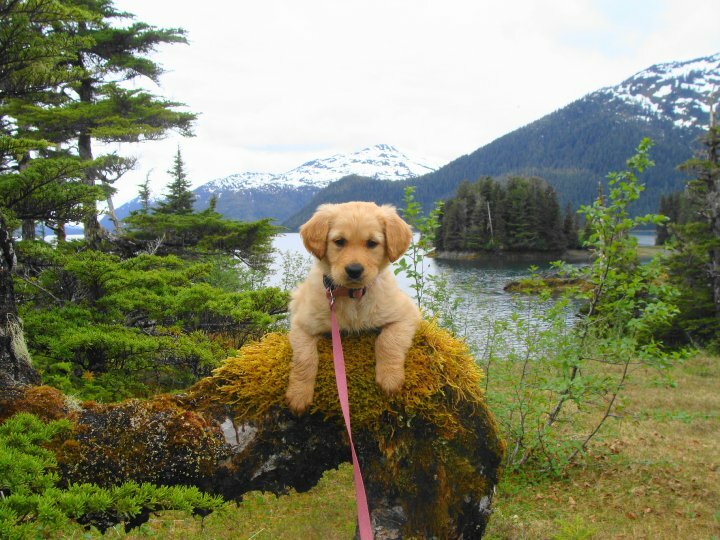 Alaska Assistance Dogs is now focusing on education, information resources, and therapeutic programs. Education is hugely important due to problems with “fake” service dogs and poorly self-trained dogs, even poorly trained agency-related service dogs. It can not be emphasized enough that a service dog is not a dog picked up at a shelter, given a few commands and, with an on-line purchased vest, put into the stressful life of performing well in public venues. The liability for that scenario is huge. Service dogs are animals with special temperaments, excellent health lineage and solid training for the rigors of public life. Service dogs are neutered or spayed, do not run around with prong collars because they don’t behave, are taught ONLY with positive reinforcement techniques, and have a lot of public venue experience to be rock solid in any situation. The intent for this website is to keep Alaskans well-informed about what a service dog is, how to get one, what the laws require, and how to get help when things go awry. There will be articles about choosing the right dog, where to get initial obedience training and how to find an experienced professional trainer. We have many options and a lot of work to do in education.